It’s here, the New Year. And a chance for us to speculate over which emerging trends are going to take off. Last year showed promising new technology jump to the forefront of ecommerce – think big phones, big data, omnichannel and social shopping. It’s an exciting time for anybody involved with online sales, but planning a profitable strategy can feel like shooting in the dark. Hopefully our predictions can help shed some light on what 2015 holds. As 2014 went on, personalised content became far more prominent. Solutions that are able to suggest items to a customer will become more popular, and maybe even a fundamental element of any successful online business. Selling aids range from the “You’ve left something in your basket” emails, to those creepy retargeting ads that seem to follow you around on every website. Ethics aside, online shopping needs to be consumer focussed and the more it can adapt to meet the needs of the shopper, the more they will buy. On a similar theme, remarketing will grow. Traditional SEO practises seem to be losing traction on search results, as Google strives to put an end to roguish growth hacking. The latest updates have seen local results get preferential treatment on the first page. Having great SEO is essential, but it is now more of a necessity than an advantage. This means companies now need to look after the traffic they do get and value these customers. Common remarketing strategies are carried out via telephone, email or by SMS. Expect these to become more popular – and more personalised. Data Data Data. All companies need to be aware of it. Whether it’s a large multi-national retailer tracking the number of abandoned carts, or a specialist steel engineer following up one lead; anyone with a website should know who’s visiting. In 2014 we started hearing about ‘big business’ handling ‘big data’. But in 2015, SMEs will start taking it more seriously too. Analytics software is readily available through programs such as PIWIK and Google Analytics, bringing a whole new mindset to ecommerce. A survey by Econsultancy found that 28% of companies have more than 5 employees dedicated to data analysis. This is a considerably sharp rise from 2013, where most companies surveyed had 1 dedicated team member (30%), or none (26%). Simple analytics programs can usually only track how many people have visited a site. More advanced systems can begin to tell you who visited and even which pages they were interested in, which can create real leads for sales teams to follow up. 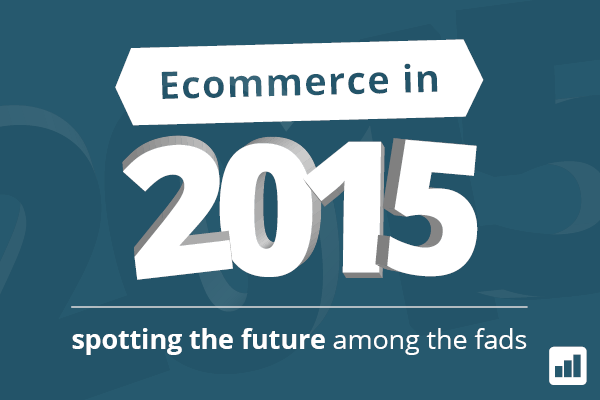 The idea of shopping on social networks made a lot of noise in 2014 but it had fizzled out by the end of the year. There is surely unlimited potential in this idea, but Facebook has always been conscious of the fact users are not happy about them commercialising the platform and sharing their data. So the introduction of Facebook Exchange and a ‘Buy button’ have been worked into the online experience very cautiously. There has been a backlash to these updates through social networks such as Ello, who are attempting to appeal to a demographic that is fed up of ads. It seems people prefer to keep their shopping sites and their social sites separate. So for the moment, social media remains more effective for external advertising than a complete ecommerce platform. But that’s subject to change. People still love offers. Not only did it consume industry news sources, it made the national news in a number of countries. Of course, we’re talking about Cyber Monday and its more physical sibling, Black Friday. Savvy customers have started to move online to avoid in-store battles, and as result, they spent £810m last year, far surpassing conservative predictions of around £555m. Over the festive period, the biggest success stories, particularly from the retail sector, came from companies that offered the most options. So it’s probably safe to say that the omnichannel experience will continue to improve. A quarter of online shoppers said they chose a retailer simply because it offered click and collect. However, 35% of customers who actually used the service said they had negative experiences (source: YouGov), often because of a lack of preparation in-store. This year stores will adapt to this, potentially even creating areas dedicated to dealing with online orders. Many companies do offer the main communication channels: phone, website, email, SMS, post. But they are often disconnected and operating independently. Integrating these channels helps a customer through the purchasing journey without having to rummage around for account numbers and PIN codes. By using smarter remarketing strategies, companies can increase their number of customers and their sales.